Here’s my answer: a well functioning market will distribute wealth (or income) in the pattern of a bell curve. Markets are artificial constructs. The only way to build a productive market is to determine the desired outcome and adjust market regulation along the way. There is no such thing as a free market; all markets are constructs. The solution can never be pre-determined. Values have to be determined and outcomes measured against those values. We have no idea what a successful market should look like. I’ve asked the following question of several economists and mostly received blank stares: “How do you know if a market is working?” It usually then moves to a discussion of jobs and unemployment numbers. But jobs aren’t the desired product of an economy, the desired product is wealth or income. Jobs can be artificially inflated: cut all jobs in half and you’ve just doubled employment. The answer to the question (is the market working?) should be the core value of any economy. That seemingly few Americans even understand the question, let alone have a coherent answer, is a problem. Is the market working? Simply overlay the graph of current wealth distribution (b) with a bell curve (a), and you get a visual representation of how well the market is functioning. 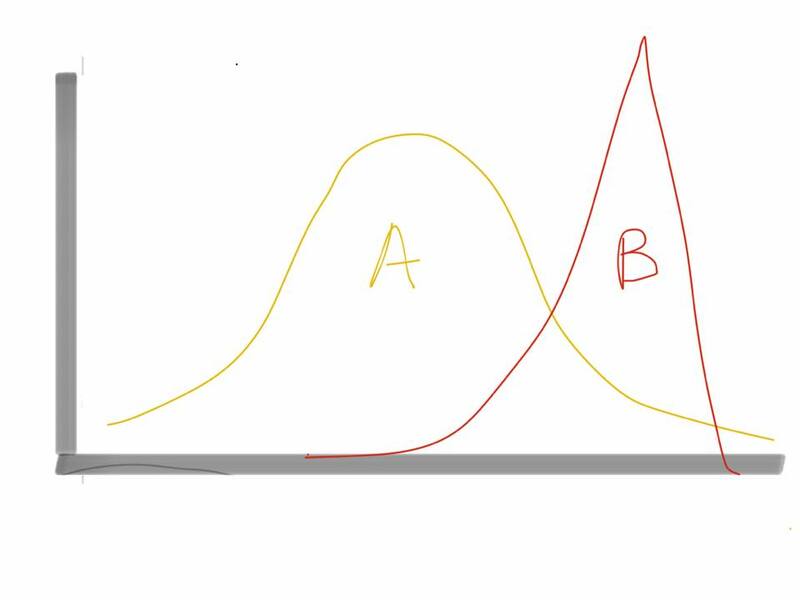 The degree to which the actual curve and the bell curve differ shows you exactly how off the market is; or said differently: B is a result of a poorly constructed market. B is NOT the result of harder working wealthy people.